For the first time ever, I'm actually participating in a retreat from the very beginning... okay, I'm a couple of days behind but that's because I hadn't checked email. I hadn't noticed the dates to see that I was just getting in at the start date. I listened to the first video last night about putting our journal together and decorating our cover. I chose this lovely college-ruled composition book from Clementine that I'd picked up at Marshalls. I had no clue at the time what I would use the notebook for but the ombre sunset tones spoke to me so in the basket it went. I didn't want to cover up the beautiful ombre tones but knew my cover needed 'something' that spoke about my journey on this retreat. In the introductory video, Amber spoke about about opening the door to our heart. She also mentioned 'monetary passion' - which is exactly the path I'm starting out on in 2018! I won't say she is psychic but the synchronicity of this project and my determination to participate in the retreat couldn't have had better timing. 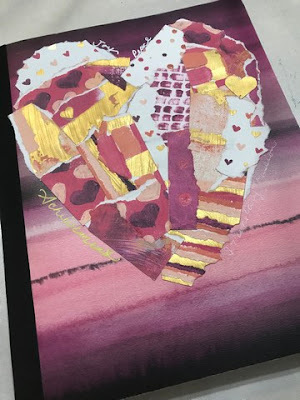 To keep with the colors, I chose to collage my heart from torn pieces of the Painted With Love Designer Series Paper from the Stampin' Up! Spring 2018 Catalog. After gluing the pieces to a heart I'd torn from printer paper, I coated the whole thing in clear gesso. Once that dried, I glued my heart to the front of the journal. Something Amber said about the heart spoke to me. 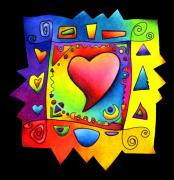 Opening our heart's door to the possibilities. Opening this journal opens up a world of insights into those possibilities. Periodically, over the 10-day retreat I'll share bits and pieces from my #womanunleashed journal. I look forward to the discovery and how the pieces of my heart's desire fit together to form the whole of my dreams. While your life may seem really crazy right now - NOW is the time to think ahead to what you want 2018 to be for you. To kickstart my creative motor I've signed up for the #WomanUnleashed on-line Retreat. I hope you'll join me! Just click on the link below and be prepared to unleash your True Creative Spirit! 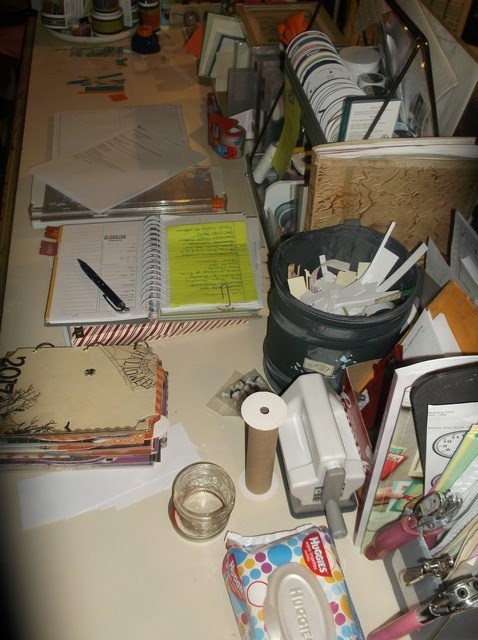 From the foreground you can just make out my lazy susan with my implements of creation and a notebook. 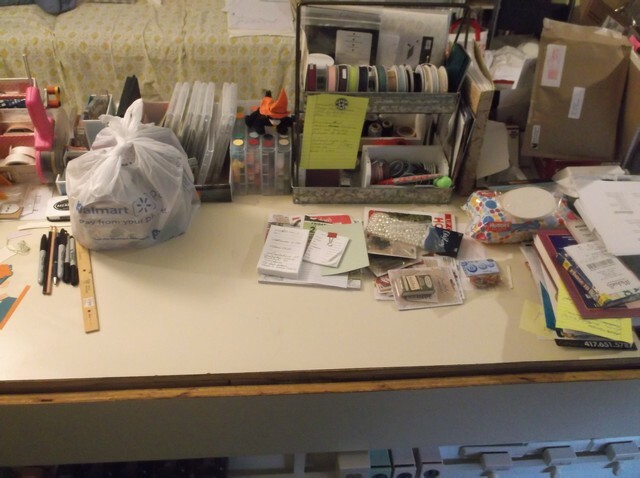 From there a SPAM can with my journal markers, to the left of that are 2 spools of lace ribbon I picked up at $Tree last night. They are in with the Christmas stuff. 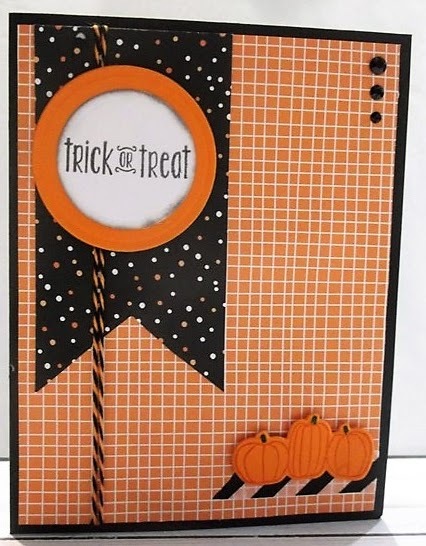 The November Paper Pumpkin box from Stampin' Up! waiting to be opened. Just to the right of that you'll see pieces of burlap ribbon. They are part of the Christmas $Tree video I need to film today. That plastic bag are the remnant pieces I need for the process part of that video. My SU collapsible litter bin and a coffee container that held quarters I turned into the counting machine yesterday. I'm all about YouTube filming today. Tomorrow, Bob and I will enjoy a quiet day of Thanksgiving. I'll start with the Macy's parade. A tradition for as long as I can remember, then on either side of dinner we'll play card/ board games and be very Thankful for our time together. We found out yesterday that Bob is off work probably until sometime in January or February. For the first time in 33 years he will be home for all of the holidays from Thanksgiving through New Years. Also, last week I quit my 'day job' with the publisher. While I understand a fledgling business being built mostly on apprenticeships, we need an income the publishing job wasn't providing. 2018 is all about building my creative business and getting some consumable books published. Doing what I love and bringing in some cash. I'll have at least one more creative post in the coming weeks but mostly about wishing everyone a Merry Christmas, Blessed New Year and winding down our eventful year. That's it for my desk this week. Who's Miss Julia and why am I here? When you are done visiting me in the Ozarks, please hop on over to Stamping Ground for all the details. Miss Julia has a long list of other studios you can peek into. No standing on an up-turned milk pail to look in the window. We open the doors wide and welcome you. Please leave your number and you'll be among the first on my list. This is my desk for the week. I left on Friday for the film premier in Poteau OK and just got home last night. I was only in Poteau Friday night - Saturday afternoon then drove to Eureka Springs AR where I spent a couple of days just enjoying the rejuvenation I always find just breathing the air in that little community. I followed that up with a night at my sister's before heading home yesterday. So, my desk. Not a lot of creativity. the bag holds the grandgirls' Christmas gifts and part of their stocking stuffers. 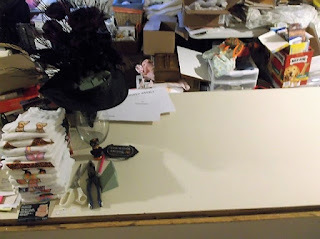 The Tim Holtz stuff is still there since I can't get to that tub to put them away. My initial plan was for Bob and I to create my Mixed Media/ Tim Holtz storage unit last Friday but then I found out last minute I was heading to OK to the premiere and birthday celebration for author Dusty Richards. This was a chance for me to meet the co-writers/ co-producers of the film... an opportunity I couldn't pass up. I'm putting this here because I know I have some planner folks on WOYWW and I'm hoping you'll join us in 2018. I love planners. I can remember being a planner person as young as the age of 10. I guess with my life in such disarray, planning 'my stuff' was my way of finding some semblance of order. Over the past two or three years, I've found a whole new side to planning through people I've met in the planning community on YouTube. I've also learned there are a wide variety of ways to plan. First there are the 'pretty' vs 'functional' planners. Some are a combination of both. There are also various styles of planning such as detailed planning, to-do list or bullet journaling. I am a functional planner but I do like to make them pretty. My life revolves around color so any time I can add pops of color to a plain page, makes me smile. One of my favorite people in the planning community is Alexis aka Miss Trenchcoat. Alexis is a productivity guru, entrepreneur and side hustle mentor. I love her thought process. One of the things I've learned is while it's nice to have pretty and to have a To-Do list (she is big on finding your Top 3), the idea of Planning brings to mind (at least for me) setting GOALS then PLANNING how to accomplish them. If I didn't plan my projects, I'd never accomplish as much as I do. My stumbling block is that I don't sit down and 'plan' every week. There are days I know what I want/ need to do but they don't always become hard in my planner pages. So one of my goals for 2018 is to make sure I UTILIZE my planner(s) to the best of my ability. 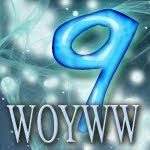 I thought since WOYWW is such fun, brings a lot of like-minded folks together, that doing a Planner Hop would help draw traffic, give us another venue to showcase what we do and products as well as get to form stronger relationships within the Planner Community. We'll also have the opportunity to see how others use their planners, share/ pick up tips, etc. By mid-December I should have a POW button you can put on your blog/ website. If you are interested in being contacted when more details come out, please let me know via the contact form and I'll keep you updated. 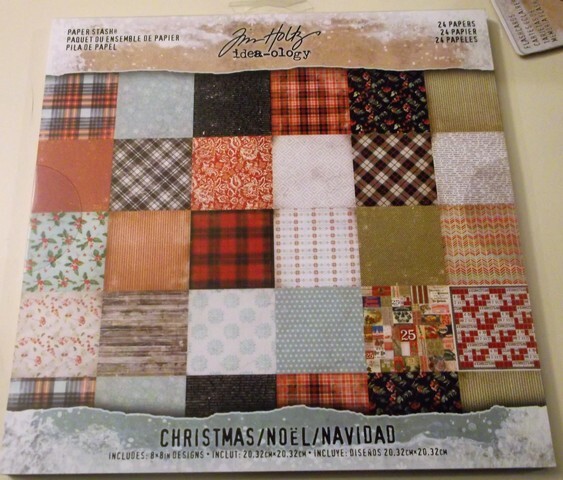 I love this 8x8 pad. Collection of Ephemera pieces. I get so nostalgic with his flash cards. I have several sets. December Daily may be Tim Holtz inspired this year. I was also lucky enough to be in when the Hot Buy paper packs were $5. I found three. 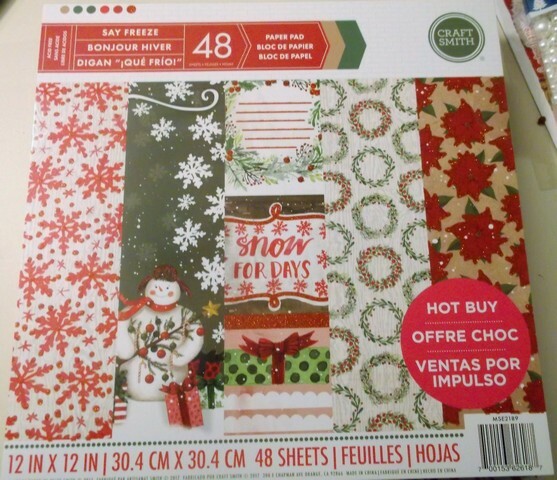 I think this one is going to be my Paper Pad Christmas Card Kick-off in January. This last one, I could not find a second pad of. We both loved this pad but she insisted I take it since I lived so far away. She'd been to my blog and said she looked forward to seeing what I did with it. 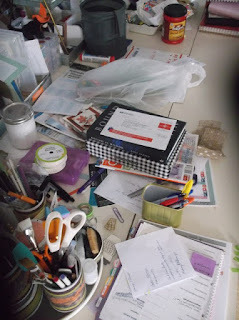 Finally, I saw the pearls in the Tim Holtz stuff but had no clue what I'd do with them. That night at the hotel I watched his FB Live launch of the holiday items and saw what he did. When I saw this larger package at Hobby Lobby for a fraction of the cost I grabbed them. And SU has a fabulous new set of Stampin' Blends I can play with! My next purchase will be at least 3 stamp sets with coordinating dies from his Stampers Anonymous collection. There's my haul. Now to just make time to play. A bit busier than I usually show. 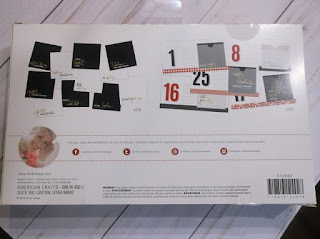 You can see my most-used tools/ embellishments along the back. In the front from left to right the Character Naming Sourcebook, not sure what's at the bottom of the next stack but my recently purchased Tim Holtz Christmas items and misc. stuff kind of dropped when we got back from the city. 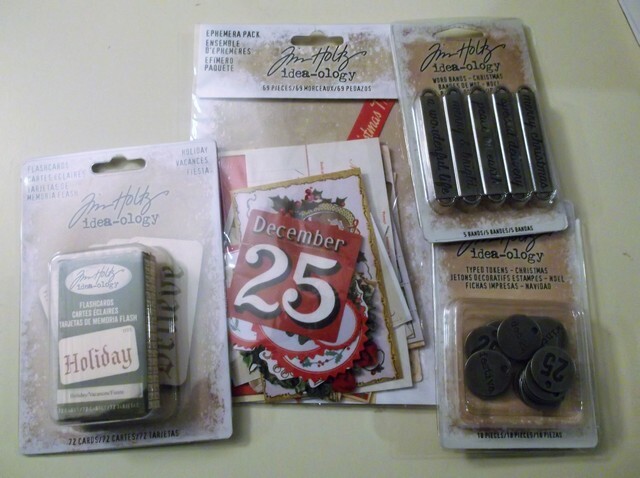 I'll have pictures of the Tim Holtz items on Friday if you want to see what I picked up. Notice the Vagabond chord, Julia. The old one is down and the Vagabond 2 in place. So happy to hear you are continuing the legacy of your 'new' Big Shot. I'm sure your creativity is being smiled upon. 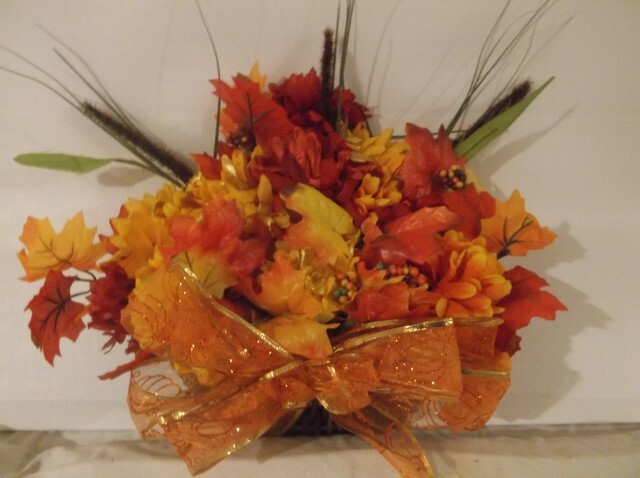 Quick picks of the Fall arrangement. Everything except the basket was purchased at $ Tree. I found the basket at a thrift store for $2. I wound up not using the pumpkins. they had been purchased for flower box arrangements I never made. Now that the Asian Beetles have died off or gone back into hybernation I have hung this in place of the witch hat. There won't be a Christmas one as the screw I hang this on is one of the anchors for a horizontal flag pole my Gingerbread Man flag hangs on. Unlike some of the houses we saw last night with their outside Christmas lights on, ours does not go on until the weekend after Thanksgiving. 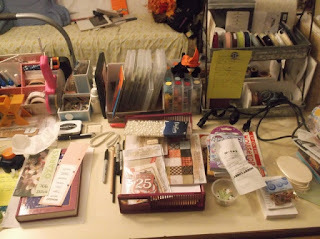 I finally got all of my often-used supplies lined up along the back of the work table again. Nice to have stuff in reach rather than on the floor. My trimmer, day planner and my October Daily album are most current. I am going to change the date on the October Daily to a 2018 so maybe I'll be ahead of the game next year instead of so out of sorts. On Day 1 of the 13 Days of Halloween I showed you the beginnings of a project. You can see that first post HERE. Yesterday, on Halloween, I was finally able to finish the door hanger... though I hung it to the side of the front door. The hang up, well part of it, was that I needed to get more flowers from $ Tree. 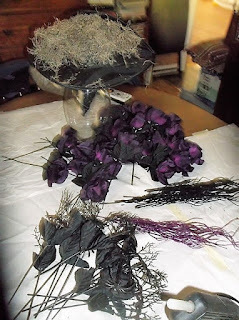 I failed to realize how many flowers I needed to fill the hat, and I wanted sphagnum moss to help cover the floral foam. There are 21 purple roses, seven spiders, two purple picks and five black picks. Considering I only started with eight roses, you can understand why I underestimated how many I needed. This is how the arrangement looks hanging next to our front door. I 'think' I picked up the sign at $Tree as well. The hat and the sphagnum were both purchased at $Tree. I'm really happy with how this turned out. Next week I'll show you the Fall hanger I've put up in it's place. There are times when I actually surprise myself. This is one of those times. 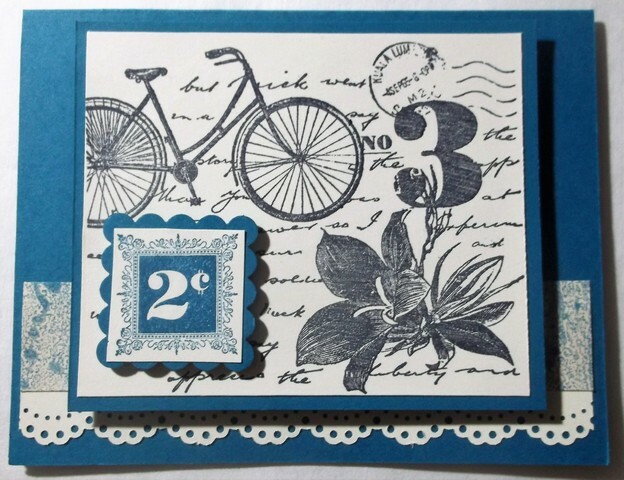 I posted a couple of months back that I belonged to a card swap group on Splitcoast Stampers. Until this month, I've not posted on time - or at all with the exception of one month until now. 2) this kit spoke to me. StampinSpooky was our hostess this month. She used mostly SU products, including DSP from the Venetian Romance paper pack (SU - 2013-2014). 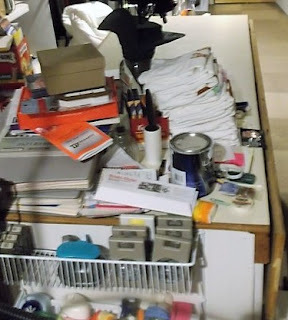 The large image, the postage stamp and the dsp strip were from the kit. I added Island Indigo as a base and a mat then punched the lace border in white. Again, the large image, the postage stamp and this time, the scallop was included in the kit. 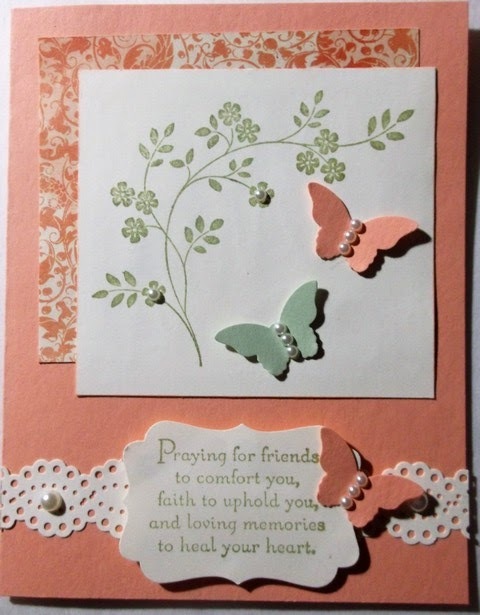 I used Mint Macaron to stamp the images and for one of the butterflies. As I type this, I have been informed that Mike has passed and now Chrissy is left to build a new life without him. Chrissy is a strong southern belle but I think in cases as this, strength only goes so far. My heart aches for her and I hope the card brings her some comfort. 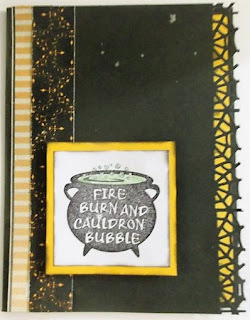 MIXED MEDIA MONDAY - En Mass Journal Returns! 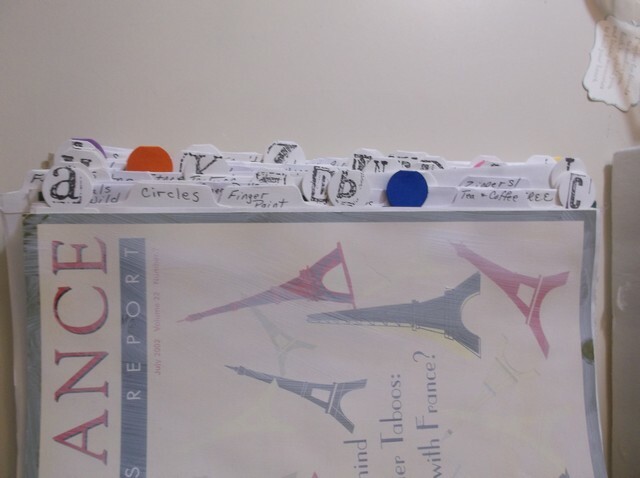 Back in February of last year, I told you about a Junk Journal project I was starting - En Masse Journal. You can see the first post of how the journal began HERE. The next post went along rather smoothly and on time (gasp!) HERE. From there, I'm not sure what happened but the journal never made another appearance - because something got in my way (surprise surprise!) and I never got back to it. So out it came for this week. Originally, I'd planned to run this the 4th Monday of each month. So I think I'll stick with that. So here we are - October 23rd and I'm diving into one of the color sections of the Journal. I went to add them to the journal last week and they've vanished. Something in the back of my mind says I threw them out when I was decluttering the space, not realizing what they were for and determined that when I remembered I'd just re-punch them... so that's what I did. While I've not actually begun working in the journal, I can now that the categories and colors are in place. Each 2-page spread is interpretive. I can play however I want. 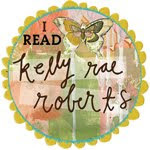 Circles, Finger Paint, Animals (wild), Tea & Coffee, Paper Dolls, Tags, Yarn & Fibers, Postage Stamps, Stars, Business Cards, Zippers/ Fastners, Textures/ Rubbings, Cowboys/ Western, Squares, Photos, Punches, Fabric, Washi Tape, Store Receipts, Faces, Triangles, Hardware/ Washers/ Gears, Glitter/ Sparkles, Colored Pencils, Buttons, Lace Doilies, Song Lyrics, Horse & Tack, Candy/ Food Wrappers, Quotes, Labels, Woven Paper, Markers, Rectangle, Leaves, Paper Scraps, Beads, Flowers, Crayons, Lists, Window Envelope, Security Envelopes, Dogs, Cats, Fruits, Vegetables, Birds, Books. There are also 4 FREE pages to whatever I might find that would make a good category. First off, I apologize for falling off the wagon on the 13 Days of Halloween. I just ran out of time. I had the projects but could not get them posted before I had to focus on packing and leaving for the conference. Then my BIL/SIL visited for a week. Rhonda and I spent the best part of two days in the studio. I managed ALL DAY on Thursday where I put together my October Daily album together from start to finish! Well, except for actual inclusions - but the base of the book is done. I'm still debating whether to use it for this year or put it away and I'll be ready to go next October. We shall see. I'll keep you posted. This is Day 11. Hard to believe we are almost through the 13 days! As you read this, I'll be packing for a writer's conference in beautiful Eureka Springs AR. I love ES but October is definitely my favorite time to visit. The dogwoods have changed color and Halloween is in the air. 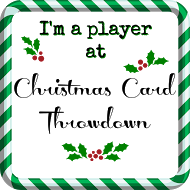 I made the banner as I did the others using the framelit squares but added a mat for this one. I added the three bats using the bat framelit in the Spooky Nights set. Once they were in place, I scribbled over them with some black glitter stickles to give them a little shine. Only two more days left! What will Friday the 13th bring? I do know I won't be doing an October Daily flip-through video. I will be in the conference all day. But I promise to have something special plus possibly a video play of all the projects I've done. I made that Recollections moon-glow cardstock as the focal this time. The three small images are from the Michael's tower baskets eons ago.. back when they were $1 baskets. These came shrink-wrapped in sets of 2. The bats are from last year's SU Spooky Fun stamp set, as is the greeting. For the greeting mat, I used the retired Curly Label punch from SU. I punched one each in the black and in the moon glow. the black one, I cut in half then clipped each one off again in the curve then off-set them on either end of the sentiment mat. The entire mat is set on pop dots. As I look at this I see my squares a bit wonky. I've been using more glue and less tape runner. I don't know about you, but it seems the tape runner doesn't have the same longevity it used to. I can put adhesive on something today and within a couple of days, pieces are falling off. My office is climate controlled so I know that humidity isn't a factor. 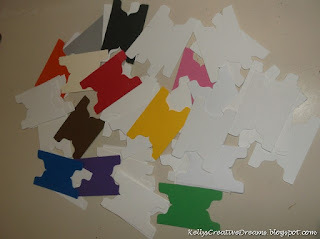 One of my favorite liquid glues to use, aside from the Mono-adhesive from Stampin' UP! is the craft glue from $ Tree. They come in 1.5 oz bottles, I believe, with a blue cap. They squeeze out in a fine line.. or if you do like I did and manage to break the tip off, you can just squeeze it out the hole and smear it... or apply with a brush for good coverage. What's your favorite adhesive to use? Labels: 13 Days of Halloween, Card, Michaels, Recollections, Spooky Fun, Stampin' Up! I am going to owe you a day! I logged almost 10,000 steps yesterday emptying all of the sewing stuff out of the studio, moving furniture and cleaning. Bob put together two 6-cubby units along the south wall and I shampooed the carpet. Today everything goes back. I can't get to the work table to finish the witch hat door hanger I'd hoped to show you today. 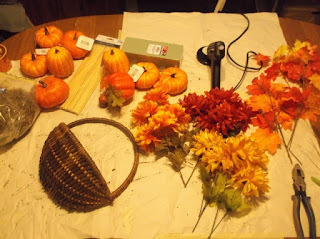 I guess the scary part of this post would be if I posted how my living room/ dinning room looks at the moment. I'd rather show you the finished product later in the week. So today, let's take a field trip! Labels: 13 Days of Halloween, My Studio, Organization, Stampin' Up! Bob came home on Friday afternoon - six days earlier than was expected. And as is the case, we have been on the go ever since. Friday we went out to dinner. Saturday we drove to Lowe's in Sikeston MO (about two hours away) to pick up a few things we needed towards getting the house back in shape. We were on the go for twelve hours yesterday! 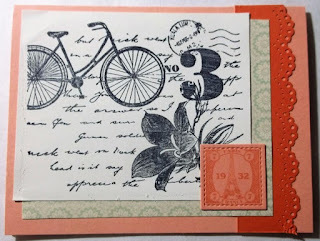 One of the reasons I love this blog in parallel to my Stampin' UP! blog is that I can use retired and non-su products here. Forcing me to use from my stash. This card is a perfect example. 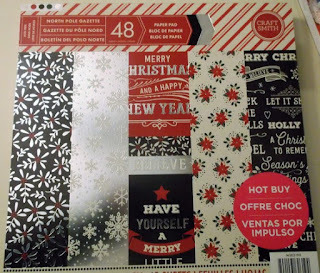 I used all Recollections cardstock. This is a black base 4.25x5.5". After folding, I used my Martha Stewart spiderweb border bunch. I lined the inside of the card with kind of a moon-glow yellow/orange cross to pull the same color in the mat behind the cauldron image. 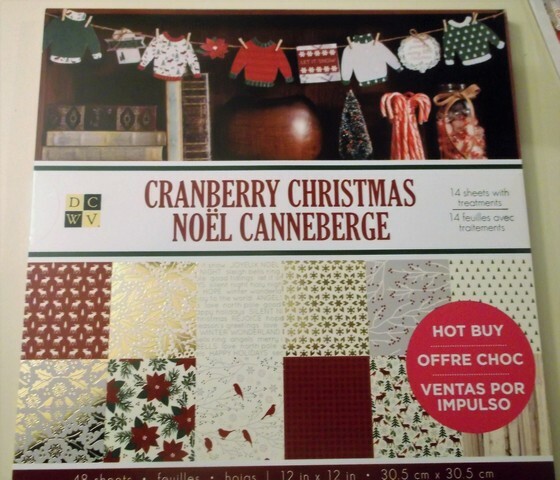 That image is one of the new ones in the Michael's Tower Bins for $1.50. I colored the top in a Japanese version of Wink Of Stella in a sparkly bright green. 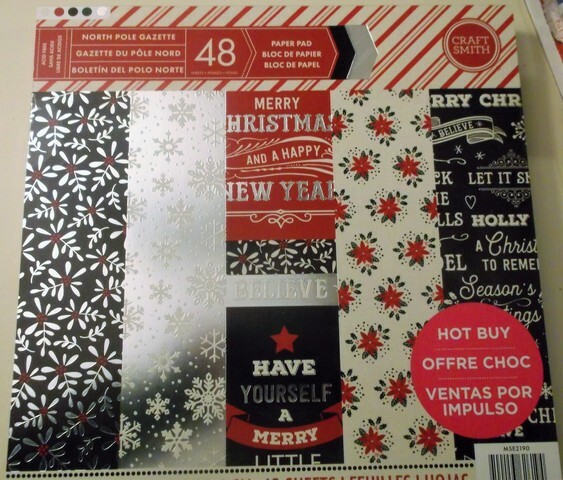 The bordering papers are cut from last year's SU Pick Your Poison Designer Series Paper. Are you making Halloween cards? Passing out treats? What's your favorite Halloween treat? Today's card is from that set I started with with on Day 4. 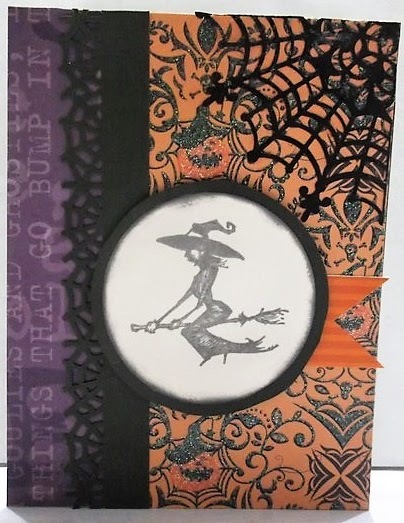 I used orange glitter stickers for embellishment and the EK Success ticket punch for the sentiment. Rather than measure for the banner notch, I pulled out my Square Framelits from Stampin' UP! I found the correct square framelit that would allow me to line up the cross-corner points with the corners on the strip of designer series paper. Doesn't always come out exactly, but once the die cut part is finished, a snip of the scissors will fine-tune the points. As I'm scheduling this on Day 5, I'm figuring out what to share tomorrow. I hope you'll come back and see. As I prepare to decorate the house for Halloween, I wanted to have something that reflects Bob's personality. He collects 'skull' type items and dragons. So when I saw THIS on Pinterest I knew I needed one for Bob's desk or on the table between our recliners. In the picture you'll see Rustoleum Glitter paint. After a few sprays, the nozzle clogged. The spray also didn't come out as black as I wanted it. I wound up raiding hubby's shop and found a can of black. 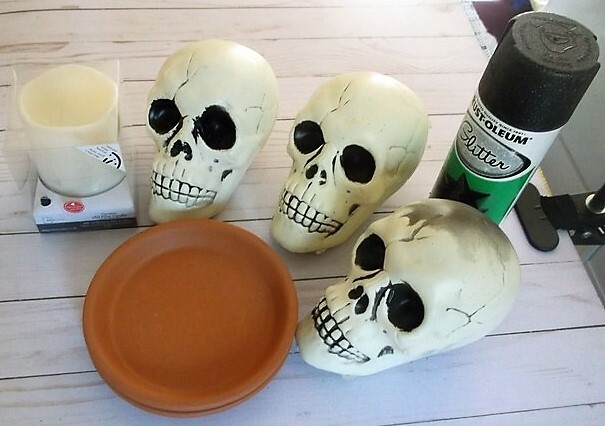 I found the skulls at $Tree, the candle at Hobby Lobby as well as the terra cotta saucers. I want to add either a skull or dragon charm to the side of the candle. I thought I had one in my Tim Holtz items but apparently not. I'll have to pick one up to finish it up when we go to the city next. Tomorrow, I bring you another take on the card from Day 3. In the mean time, I'd love to hear your opinion. 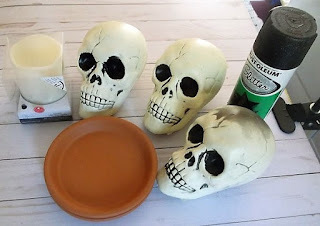 Would you have followed the Pinterest example and painted the skulls, or do you like them al natural? This set from InkaDinkaDo is configured to create a marionette. My plan is to stamp the images in position on white cardstock. 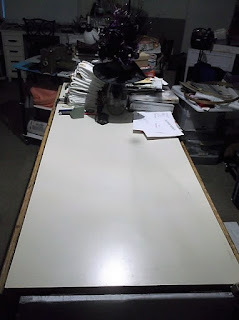 I will place the cardstock on my lightbox then position the dish towel over the image and pencil-trace for embroidery. 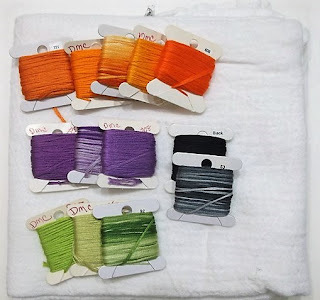 I hope to get some embroidery time in this weekend and have an update next Thursday. I know.. clean? Sort of. About two-thirds of the top is cleared ready for the next project. The stuff to the left - the stacks of night shirts for the girls I still need to trim with puff paint, and the witch hat door hanger in progress. I need more flowers. A shot at the full length taken from the office door. And full scope of what you can't see in either of the other two pictures. My punch rack is attached to the end of the work table, you can see a pile of stuff by the paint can I need to go through. The paint can is being used for cubby's I'm painting. The stack to the left is all of my fair ribbon binders I told you about, the September Paper Pumpkin kit and nesting Paper Mache boxes for one of the 13 Days of Halloween projects. Speaking of 13 Days of Halloween... I started on Monday October 2nd HERE and am putting up a new Halloween-related item every day through Friday the 13th. I was inspired by THIS Pinterest post. The actual post is on a Bloglovin' blog that has a pop-up at the bottom requesting you sign up for her newsletter. There is no way that I can see to get rid of it without actually signing up or connecting with her on FB. You'll see that mine is quite different. I think she used the larger card mat. Three banners will not fit across a standard 4.25x5.5 card base. Since I'd already cut three circles/ mats/ banners, I turned them in to three separate cards you'll see throughout the 13 posts. 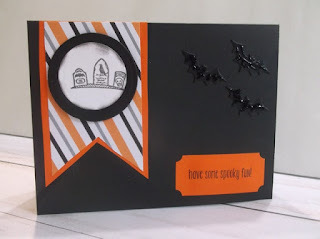 I used the Spooky Fun stamp set from last years Stampin' UP! Holiday catalog as well as the Designer Series Paper, washi and bakers twine from there. The three Black Rhinestones are from this year's 2017 Holiday catalog. 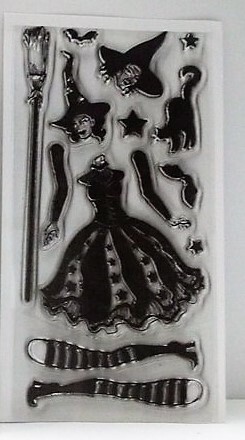 I intended to have the witch hat door hanger today but I ran out of flowers so I need to pick up some more at $ Tree before I can finish the project. 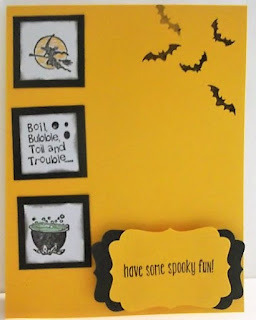 I'm racking up the Halloween cards and I intend to mail every one. I'm not sure what tomorrow's post will be but Friday I'm hoping to have the video of the beginnings and first week of my October Daily album. I hope you'll come back. That's it for my desk this week. Who's Miss Julia and why am I here? That's my desk? What's on yours? When you are done visiting me in the Ozarks, please hop on over to Stamping Ground where Miss Julia has a long list of other studios you can peek into. No standing on an up-turned milk pail to look in the window. We open the doors wide and welcome you. Please leave your number and you'll be among the first on my list. 13 DAYS OF HALLOWEEN - Day 3 & WINNER! 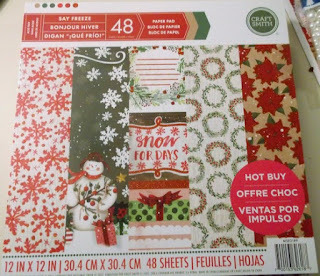 For comments on the Christmas Notebook post, I offered up the Countdown to Christmas from Heidi Swap - Kind of a December Daily in its own design. 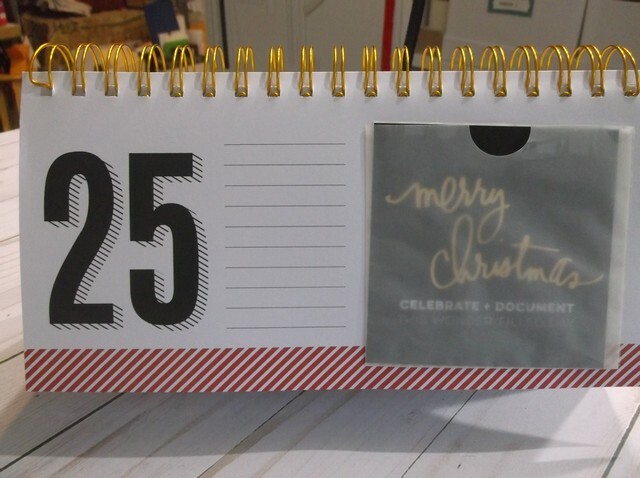 There are 25 daily sheets to journal and add a picture as you count down the days to Christmas. Cara. Cara is a talented stamper/ creative over at Crafting Bunnies! I hope you'll hop over and Congratulate her! 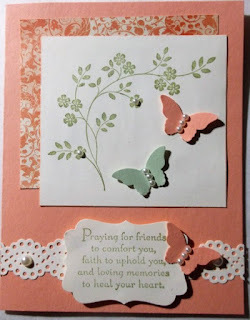 I made this card using mostly scraps and some of my non- SU stamps that I don't get to use very often these days. 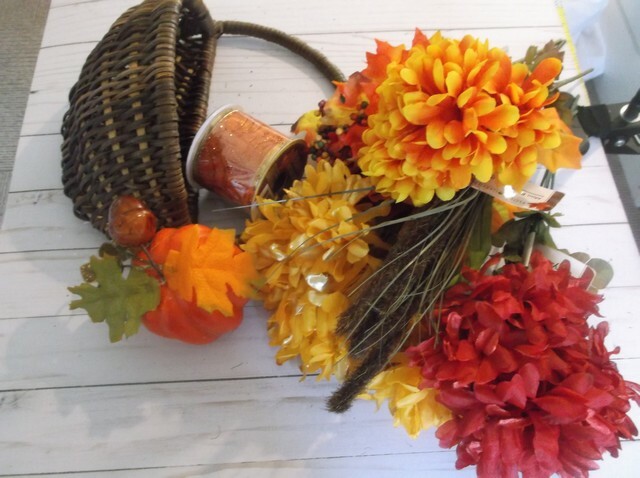 This image is one of the new ones by Craft Smart from the tower baskets at Michaels. I've also used Recollections cardstocks. They are a bit 'rustic' so lent themselves to this project. 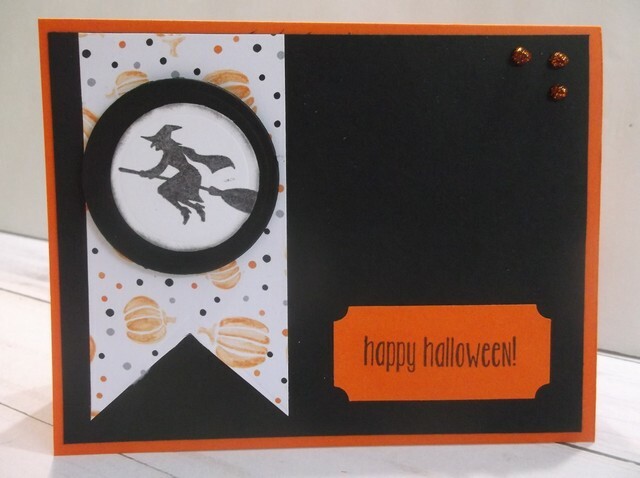 I stamped the witch on vanilla with SU Basic Black ink then cut the circle out using the #3 Spellbinders circle (If you count from the largest ring in towards the center of the rings). After cutting out the circle, I dusted the edges with Basic Black using a finger dauber. 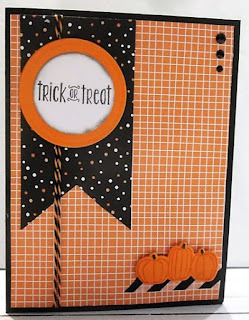 The purple patterned paper is from Karen Foster and the larger orange/ black panel is called Haunted House by Craft n Craftin'. The orange flag is from my paper stash. I decided I needed a little something extra so I cut one of the spiderweb doilies from last year's SU holiday catalog into quarters and adhered one of the sections. 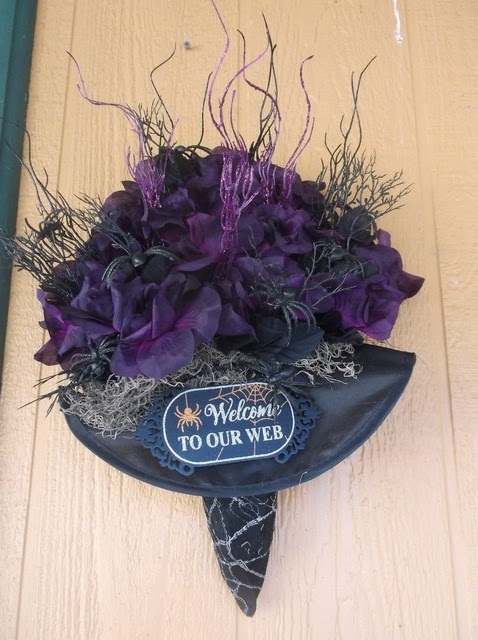 This helped to tie in to the Martha Steward spider web punch trim. 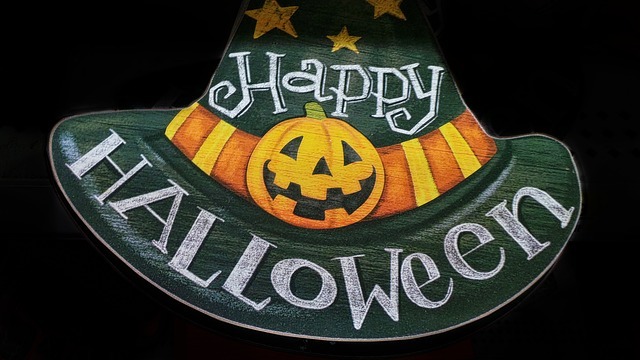 Are you getting ready for Halloween? Tomorrow I'll have another card and I have the witch hat finished to show you.